The binomial distribution B(n, p) provides a probability model for the total number of successes in a sequence of n independent trials, in which the probability of success in a single trial is p.
Using a calculator, we can calculate this to be about 0.02579813. We can also use the binomial distribution to answer questions such as: how likely are we to observe at least 28 As in a 100-letter DNA sequence, if the probability of an A is p = 0.14? Here pbinom(27, size = 100, prob = 0.14) tells us the probability of observing up to 27 As in the DNA sequence. 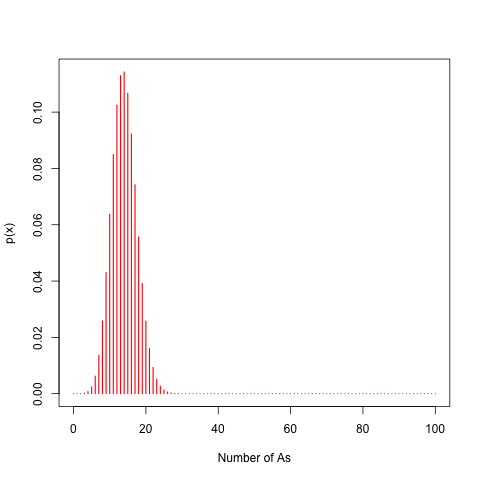 Therefore, 1 - pbinom(27, size = 100, prob = 0.14) gives us the probability of observing 28 or more As. This tells us that 19/100000 of the simulated sequences have 28 or more As, and so we can estimate that the probability of observing at least 28 As (ie. 28 or more As) is 0.00019. This is quite similar to the correct value of 0.0001954555 calculated using pbinom() above. Of course, the use of the binomial distribution for these calculations assumes that the probability of A is equal at each position of the sequence, and does not depend on whether A/G/C/T is found at adjacent positions in the sequence. A nice example of a published paper that uses the binomial distribution is by Li et al. (1998), who modelled the number of C/G versus A/T bases in n-bp chunks of yeast chromosomes using a binomial distribution. Interestingly, they found that when they looked at short chunks of yeast chromosomes (small n), the binomial distribution approximates the data well. However, for longer chunks of yeast chromosomes, the binomial distribution fails to fit the data. Acknowledgements: thanks to Roger's equation editor for making the images of equations.